An entry into the MSXdev'12 challenge, Subacuatic by the Mojon Twins is difficult to pigeonhole into a single category - I'd perhaps call it an "action-adventure," but I wouldn't want to give the impression that there's lots of action going on, so let's go for "underwater exploration game." Maybe that's better. Moving along, in Subacuatic players take the role of Ferdinand W. Templeton, an archeologist who must dive underwater to rescue his 4 prized artifacts so he can marry his lover and have enough money to keep on going. He has a phobia to water as well. This does not bode well for Mr. Templeton, as the perils of this particular undersea world are everywhere. Even the seaweed will actually kill him, as no doubt many players have already discovered the hard way. Our fearful diver must navigate the watery labyrinth with nothing but an oxygen tank (which consistently depletes) and a spear gun (which can freeze enemies, but has very limited ammo). Merely graze any of the baddies swimming about - or even the foliage - and our weak-lunged hero will lose oxygen at an alarming rate. The only way to replenish the O2 stock is to head topside. 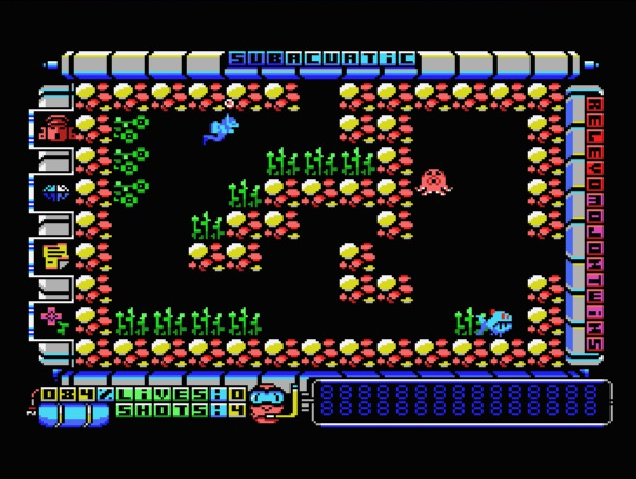 Additionally, there are oxygen bubbles scattered throughout the maze that will bestow an extra life in the form of a backup tank of oxygen. Gameplay in Subacuatic is frustrating. My first issue is that our diver friend moves very, very slowly. It just feels like it takes ages to travel from one spot of the screen to another, and really slows down the pace of the game. However, I understand why this was done, because high-precision movements are absolutely required to avoid taking damage at every single turn. The problem is that it's clearly designed with tiles, and if Ferdinand bumps even a single pixel of the square end of a seaweed tile on a turn, there goes several percentage points of oxygen. This is difficult to avoid even with the utmost care and gaming experience, and means that players can't trip up at all, and must collect as many of the extra lives as possible just to survive. If you ever played Legacy of the Wizard for NES, you'll be familiar with this aggravating method of hit detection and constant life depletion. 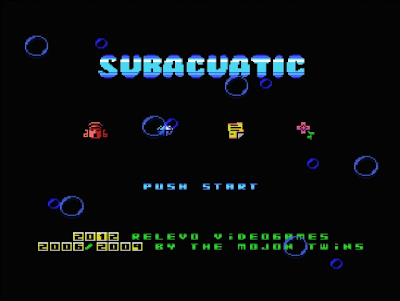 Where Subacuatic shined for me was in the graphics and sound department. Although sparse, the gameplay tune was atmospheric and easy to listen to. 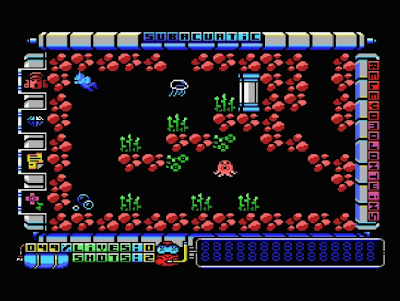 I quite liked the graphics; the underwater theme was pulled off really well here, with nice little details like the occasional bubble rising to the surface and a water overlay effect that causes the whole screen to sway as if viewed through an underwater porthole, 8-bit style. The stylish wrap-around HUD pulled my heartstrings, too. However, the visual and aural niceties weren't enough to compel me to swim through the entire maze; I'm ashamed to admit I only collected 2 of the 4 artifacts. 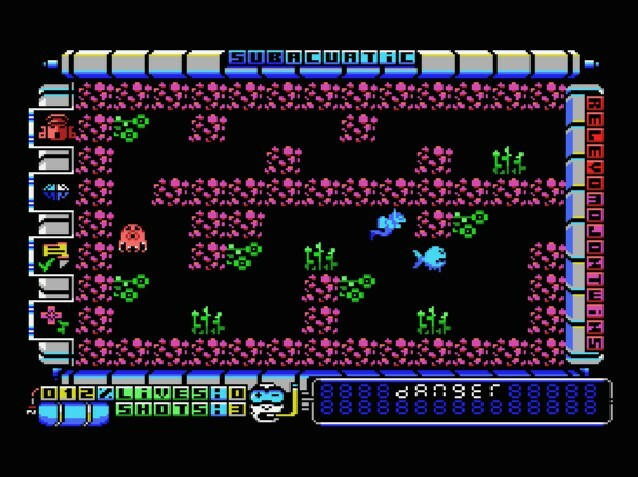 I just didn't have the patience to give it another go, performing all the same actions in the same maze all over again only to be caught on the last pixel of the edge of a soggy weed tile and die a horrible plant-induced death. I would encourage all retro game lovers to fire up Subacuatic at least once to take in the cool visuals and interesting soundtrack, but I'm sure only a devoted few will see it through to completion. Download the game here (from The Mojon Twins' site). Run the ZX version using Spectaculator (shareware) or Klive (freeware). 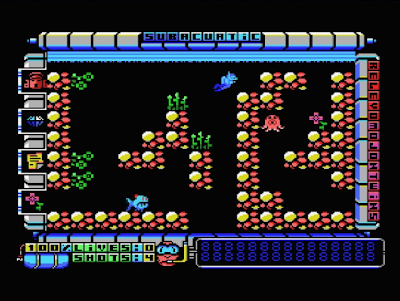 Run the MSX version using blueMSX (freeware). 2019 C64 16KB Cartridge Competition! 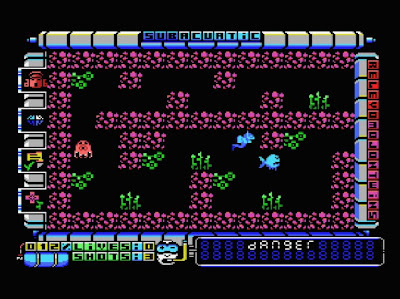 Click here for details regarding our C64 game development competition! RGCD proudly supports the Made in Creative UK initiative, raising public awareness of our nation's contribution to the global games industry. Introducing The New RGCD Shop!